The City of Atlanta, under the direction of Mayor Kasim Reed, is displacing residents to create a new park and a pond. The plan is being billed as a solution to flooding that the targeted residents don’t experience. However, the proposed park and pond will displace Peoplestown residents to make room for the development anticipated after the Atlanta Braves move out of Turner Field. The City’s plan tracks the demolition of the nearly 100-year old African-American church in 2014 to make room for the construction of the new Falcon’s stadium. The human impact of the City’s plan, which independent engineers and environmental organizations have described as fundamentally flawed, is to displace families and to destroy a community. In fact, the City rejected a proposal submitted by an engineering firm it hired to turn parking lots in Turner Field into permeable space to absorb the water that floods the area, during intense storms. The City rejected the proposal in favor of one that would destroy a historically black community. The City’s priorities are clear: development is more important than neighborhoods and parking lots take precedence over people. Despite the City’s promises that residents “would be made whole” and people would be “happy” with the offers they received; the City has reached out with offers to people that don’t even allow them to pay off their mortgages, let alone move into comparable homes in comparable neighborhoods. Furthermore, the settlements are communicated against the backdrop of a disturbing threat: if you don’t accept these insultingly low offers we will take your homes. Displacing people for a plan that will not work is irresponsible government. Destroying black neighborhoods is unconscionable. The City says it is taking homes to save residents from phantom flooding they don’t experience. But, who will save the people of Peoplestown from the City? 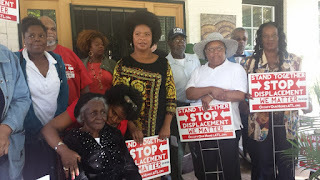 Please consider signing our petition and join more than 4,000 others opposed to the City's plans to displace Ms. Jackson, a civil rights legend who carried the Olympic torch in the 1996 games, and her neighbors!! 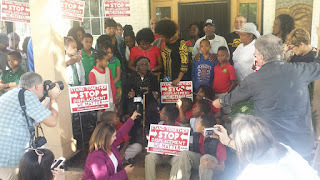 Residents Proclaim, "Peoplestown Will Not Go Down"
This past Tuesday 93 year old Mattie Jackson and the remaining residents on her block held a press conference declaring that they will refuse to leave their homes despite the City’s threat to demolish their homes and build a park and a Japanese style retention pond. 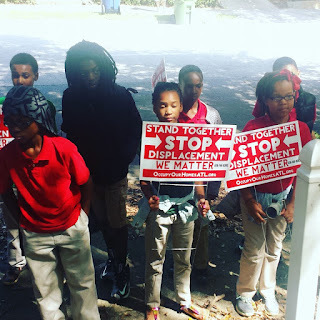 Immediately following the press conference residents and supporters, including dozens of children marched through the community passing our yard signs and advertising a “Save Our Block” BBQ Thursday 9/17 at7pm at 163 Ormond Ave SE. 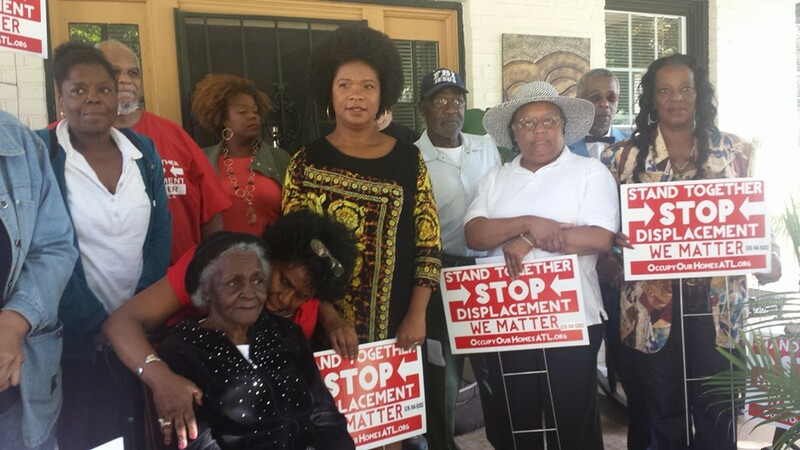 Peoplestown residents attended an Urban Design Commission meeting last week to express outrage that their homes, which do not flood and require no flood insurance, are slated to be demolished to make way for an Old Fourth Ward style park and pond. It has become clear that the City does not plan to budge, despite the community’s concern over mass displacement and gentrification and concerns expressed by several members of the Urban Design Commission about the efficacy of the proposed plan. On Tuesday the remaining Peoplestown residents made it it clear why they have decided not to leave their homes and presented the press with information on alternative plans to deal with flooding that wouldn’t require demolishing a block in the heart of the Peoplestown community. The Dept of Watershed's own expert, other engineers and environmental organizations have proposed plans that will be less costly, more efficient, and more sustainable and will not call for the displacement of homeowners. The Urban Development Commission expressed concerns about the City's plans to demolish homes in Peoplestown and about the City's failure to provide residents with any notice of the petition hearing. Despite these concerns, the City is moving forward with its plans which includes demolition of several homes that the City does not own and which do not flood. 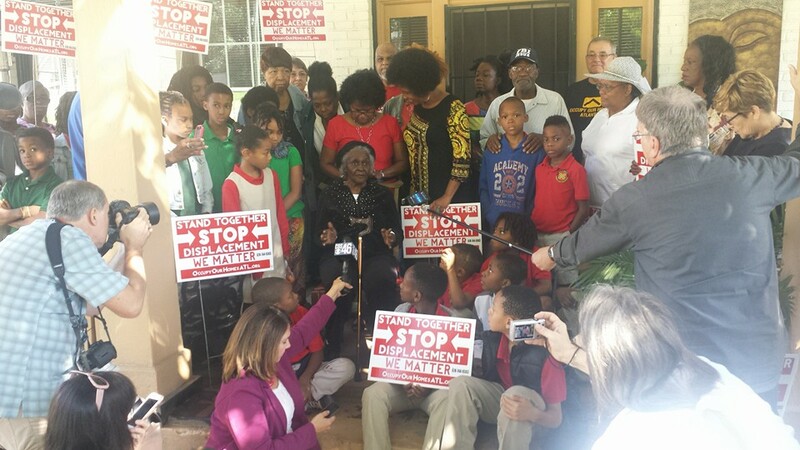 Residents of Peoplestown, including 93 year old civil rights activist Mattie Jackson, are opposed to these plans and refuse to give in to the City's threats to take and demolish their homes.